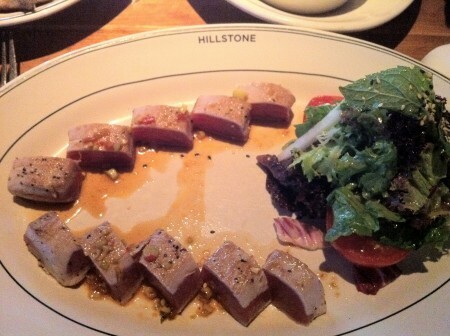 Hidden between Montgomery and Embarcadero, Hillstone is part of the Houston’s restaurant family and serves New American Fare that is true to fresh ingredients and big flavors. Reservations are essential – even with one there was a slight delay before we were seated. We started with a Iceberg Wedge & Blue Cheese Salad with Campari tomatoes and warm beets along with Oak Grilled Artichokes and Spinach Artichoke dip. The grilled artichokes were charred and served with a few simple dipping sauces – simple and tasty. The Spinach artichoke dip was a perfect dish to share, cheesy and thick. I usually don’t order blue cheese because I find the cheese overpowering but the blue cheese salad was actually quite creamy and well balanced (not too strong). For entrees we began with Hardwood Grilled Trout which is cajun seasoned trout, served with seasonal vegetables, followed by Jumbo Lump Crab Cakes with pommery mustard sauce, served with hand-cut French fries and coleslaw and finally the Flying Tuna Platter with mixed greens, avocado, mango and miso vinaigrette. The highlight was definitely the Flying Tuna Platter (Above) which was seared perfectly. The mango and avocado complemented the tuna so perfectly that I found myself trying to get a piece of each component in every bite. Tags: Artichoke, avocado, Crab Cakes, Mango, New American, San Francisco, Spinach, Trout, Tuna.